How’s this for a great Father’s Day weekend: Load up “MyConnie” with camera and camping gear, point the front wheel north, and GO! Just me and MyConnie getting some quality time together since the wife and youngest son are away for a few days. I plan to update this post throughout the trip, so come back often to check it out. 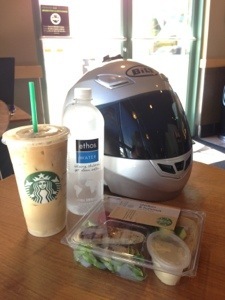 Thank God for Starbucks and lane splitting. 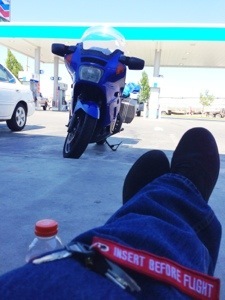 Sitting still in 88 degree weather on the freeway is not my idea of a good time. Seems like everyone else in the world is escaping to Lake Tahoe. Well, at least a rider can get hydration, caffeine, a healthy snack and WiFi thanks to the Pequod’s chief mate. Possibly the best $29 I have ever spent was on an evaporative cooling vest. After a two minute soak in the bathroom sink at Starbucks (which was immaculately clean) the vest is “charged” with water. 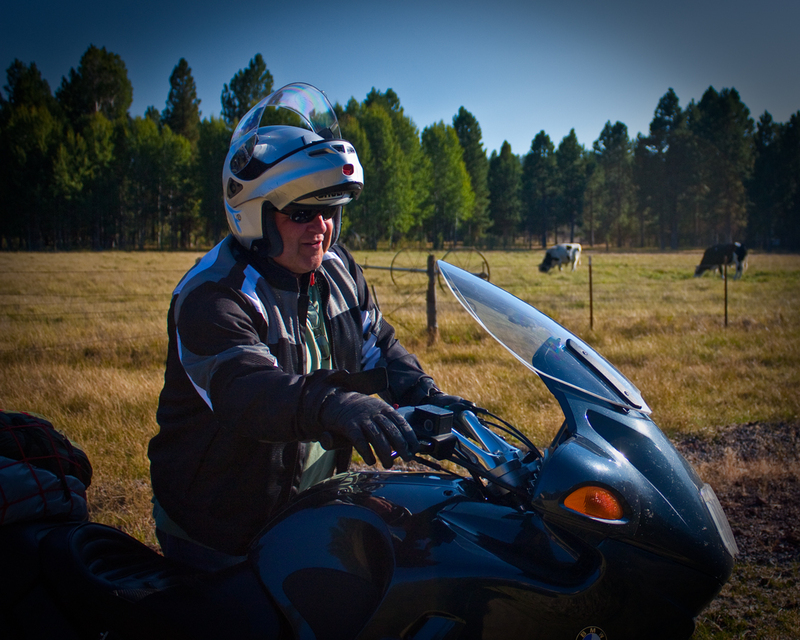 You then blot off the inside fabric barrier that stays dry against your shirt, and put it on under your riding jacket. I was then able to ride in complete comfort in 90 degree heat. Amazing. 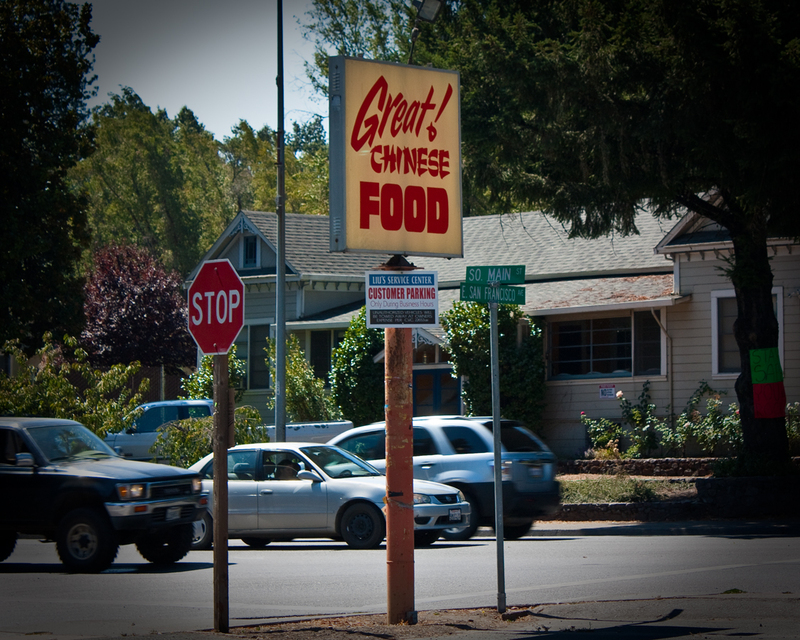 After stocking up on pita, avocado, bananas, water and a salad bowl at the Grass Valley Safeway, I headed north on Hwy 49 towards Downieville. 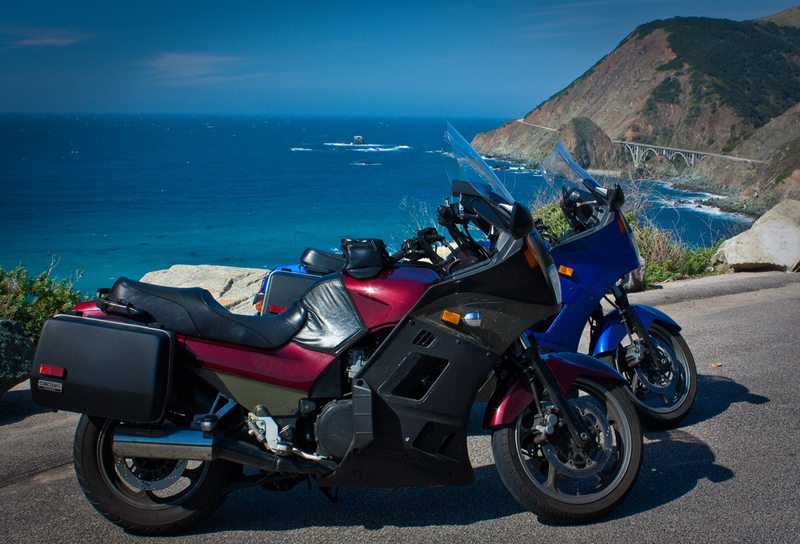 This road is listed in the Destination Highways moto-map book as DH9 and carries a score of 81/100, and it deserves it. It is wonderfully scenic, twisty and empty of traffic. 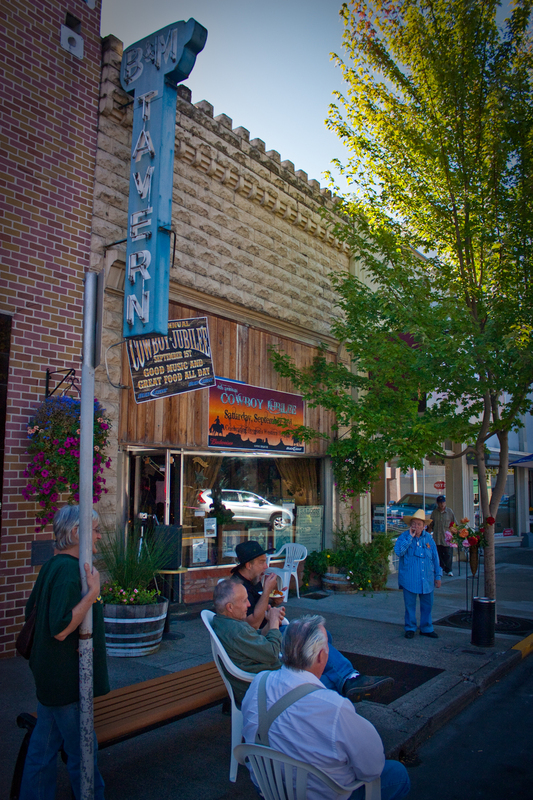 Downieville itself looked very cute, like a preserved gold rush era town. 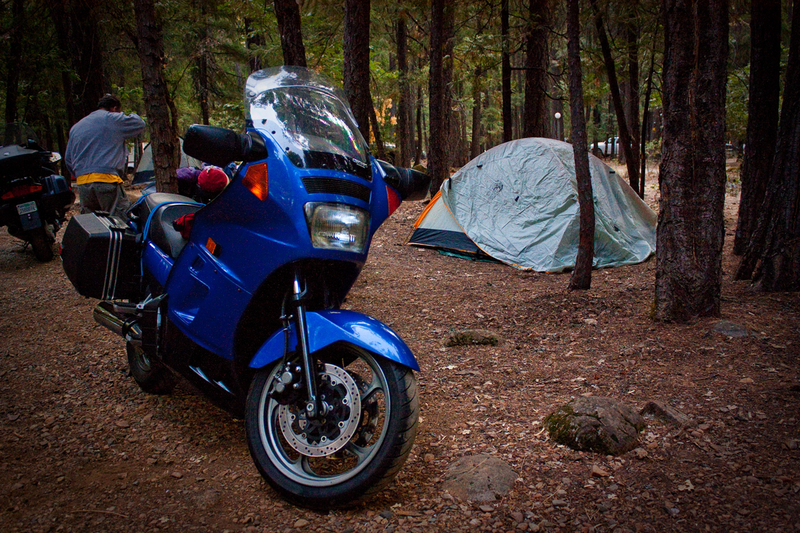 I decided to camp instead of finding a room, but on some future trip, I’m definitely going to stay in Downieville. I timed my ride so that I could set up camp while it was still light, but only just. I use a great iPhone App named “Sol” that tells you times for sunset, dusk, dawn and sunrise wherever you are. 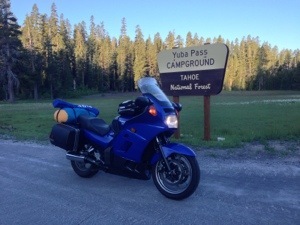 This allowed me to keep riding until I found Chapman Meadows campground around 8:00 P.M.
Getting old is terrible. I remember when hotel rooms were $6.00 at Motel 6, so it makes it painful to pay $21 for one night at an unimproved campground. Well, at least it had “nice” pit toilets. 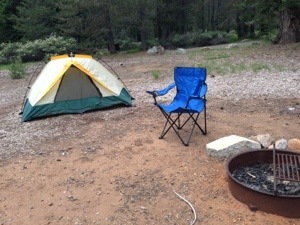 The mosquitoes quickly drove me into my tent where I fell fast asleep straightaway. The great thing about traveling alone is that you don’t need to cater to anyone else’s schedule. 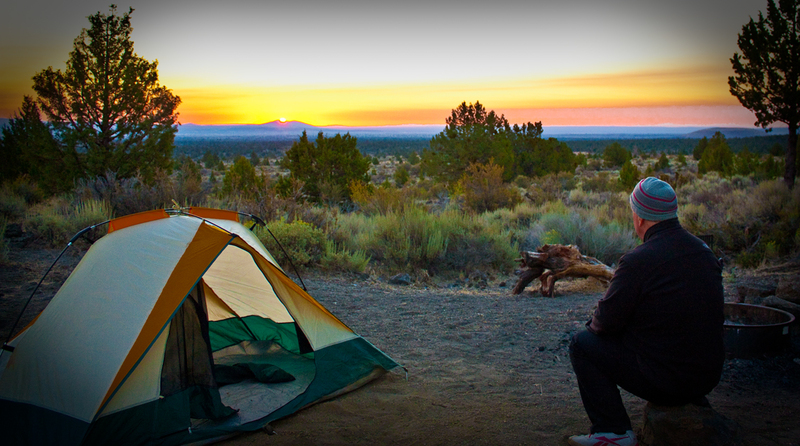 So, at 4:45 A.M., I rousted myself out of my down cocoon, performed my morning ablutions, and started breaking camp. I got on the road a little before six and headed over the Yuba Summit to be treated to a gorgeous sunrise over the Sierra Valley. 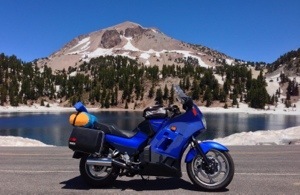 I left Hwy 49 a little before Sattley and turned north on Hwy 89, headed towards Quincy and Lassen Volcanic National Park beyond. Although I was bundled up in layers, winter gloves, and TurtleFur neck warmer, I was freezing when I arrived at the Express Coffee Shop. Nothing that a spinach omelet and 10 cups of coffee couldn’t cure. Something tells me MyConnie is going to get a few more RPMs now that MY motor is running. 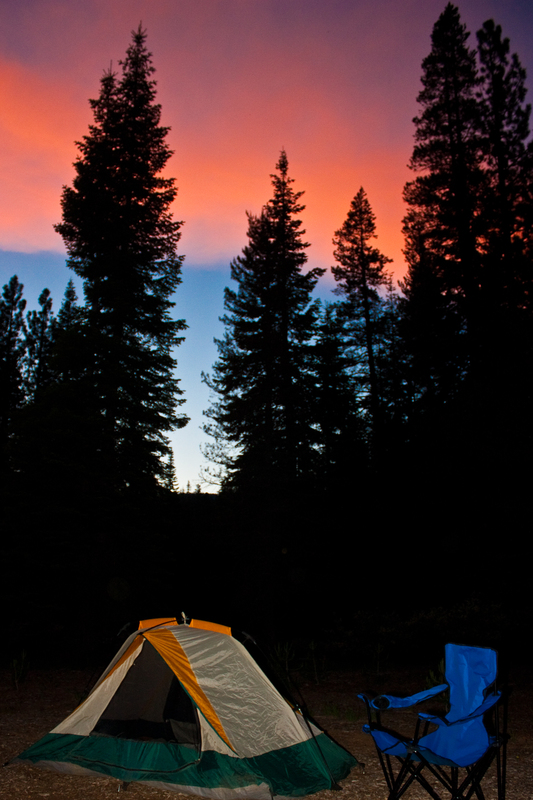 Can you ever overdose on the beautiful conifer forests of the High Sierra? 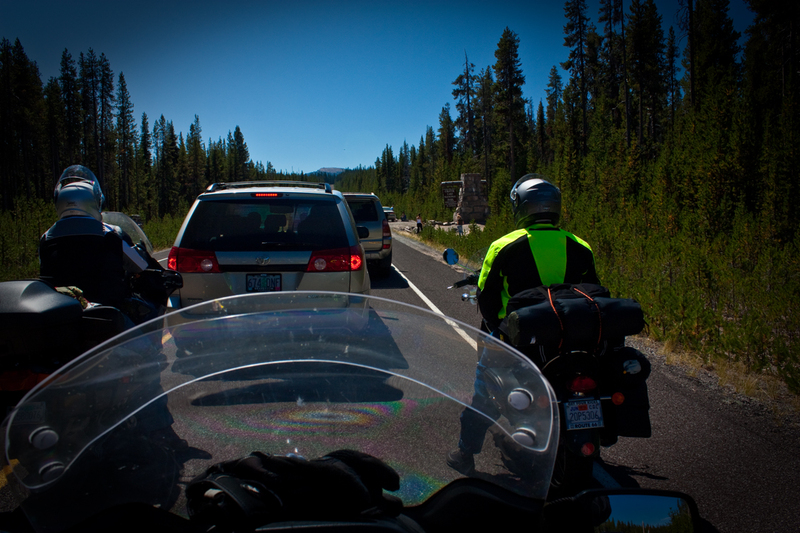 I think not, but you certainly get your fill traveling through the Tahoe and Plumas National Forests. 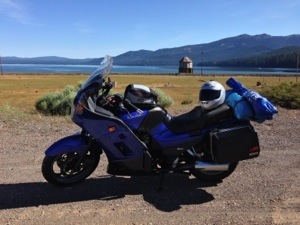 But every once in a while, the trees are interrupted by a glorious body of water like Lake Almanor. I crossed over Canyon Dam and marveled at this man-made interruption to the Feather River. The outlet tower shown behind MyConnie sends the product of this 90 foot deep reservoir to two smaller reservoirs and others downstream to powerhouses capable of creating a total of 360 megawatts of electricity! 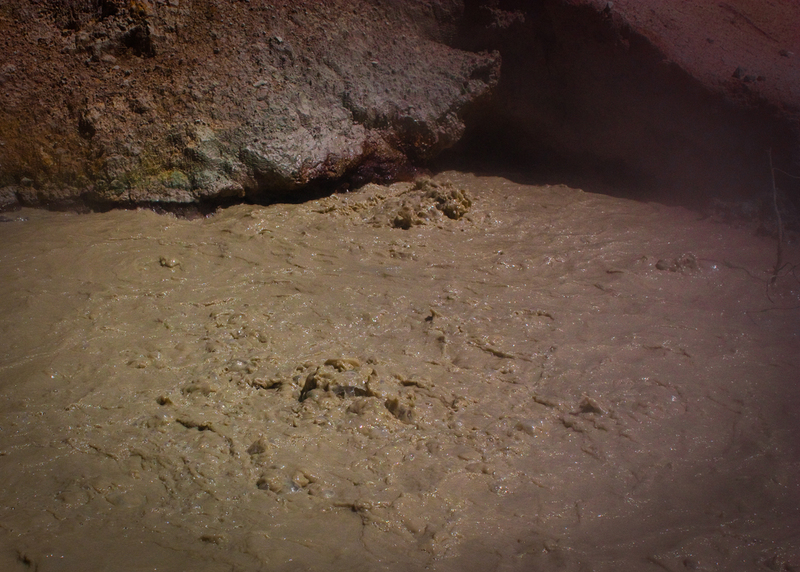 I had been to Mount Lassen Volcanic National Park years ago but wanted to experience it’s burbling mudpots and sulphur-spewing springs anew. 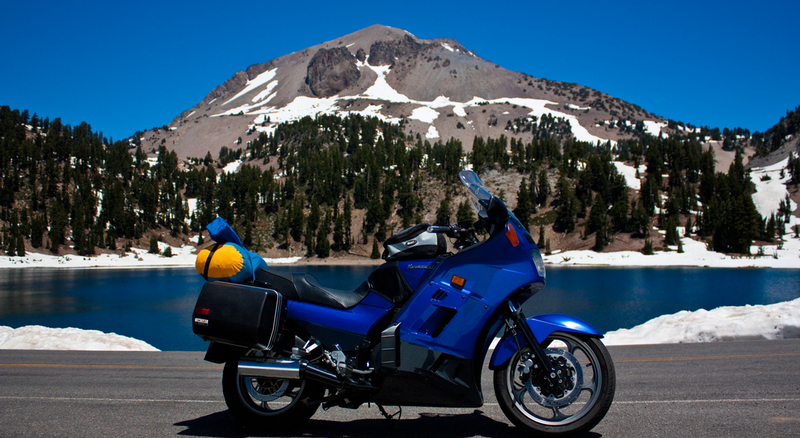 So I checked my trusty map book and found that the roads to, through, and around Lassen are included in their lists of great motorcycle roads. 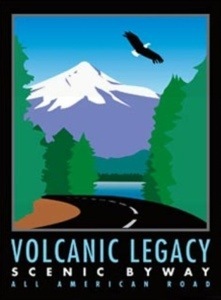 Without any hesitation I pointed MyConnie north along the Volcanic Legacy Scenic Byway. One of the troubles of blogging “live” from my AT&T iPhone is how poor their rural mobile phone service is. However, after paying my $10 park entrance fee, I noticed this sign and for a fleeting moment hoped that the U.S. Park Service had embraced modern technology by installing WiFi thorough the park. Alas, it was the icon for an amphitheater I mistook for WiFi symbol. D’Oh! 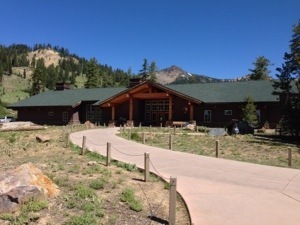 The Kohm Yah-mah-nee Visitor Center shows a great 20 minute documentary film every half hour that explains the history and formation of the park which is the only place on earth with all four types of volcanos. A mile north is The Sulphur Works where you can smell noxious fumes and see bubbling mud. After that, it seemed that every quarter mile were increasingly beautiful places that beckoned me to stop and take a photo. 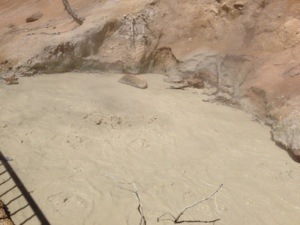 Unfortunately, the walking trails to “Bumpass Hell” which take you right next to all of the bubbling water and mudpots were closed due to safety concerns. But the ride up and over the ridge at around 8,500 feet elevation was spectacular as was the ride down and around to the north end of the park. At this point, I had enough of solitude and decided to head home. 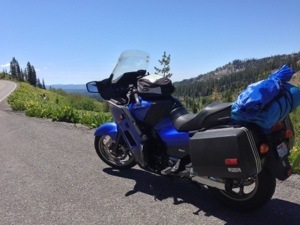 I took a few more “Destination Highways” that were perfect for motorcycles on the way, but most was spent traveling 75 MPH on Hwy 5 in 90 degree heat. Once again, thank God for my evaporative cooling vest and the many rest stops and convenience marts along the way. 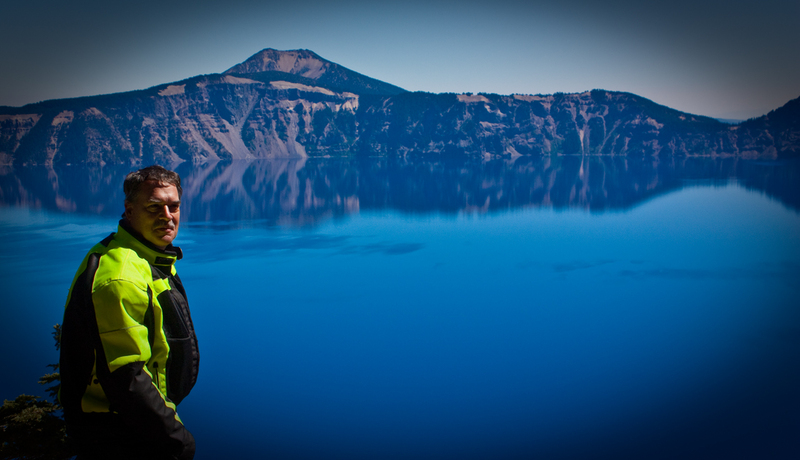 I’m thinking of hosting a “Volcano Ride ‘n Photo Tour” for anyone who might want to join me. If interested, I’d be happy to share some tips on taking photos and “processing” them in the computer, as well. Please leave a comment if you are interested and I’ll start thinking about this for later this year. 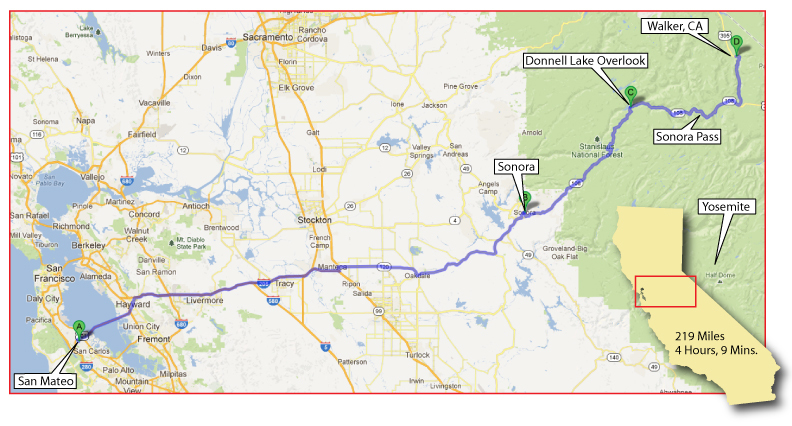 As for this trip, I racked up 671 miles from noon Friday to 6:30 P.M. Saturday, a bit over 30 hours. Not bad for my first Father’s Day weekend solo trip. It’s not often I get so much “me” time to think about life without the distractions of other people (no matter how pleasant) or social media (no matter how addictive – then again, I am writing this post!). I might just have to make this an annual pilgrimage. Note to fellow bloggers and those thinking about blogging: I took all of the photos above and wrote all of the text during the trip itself using the WordPress App for iPhone. This made ‘capturing the moment‘ much more spontaneous and added to my enjoyment of the ride. I went back later on my computer and added the sections below. 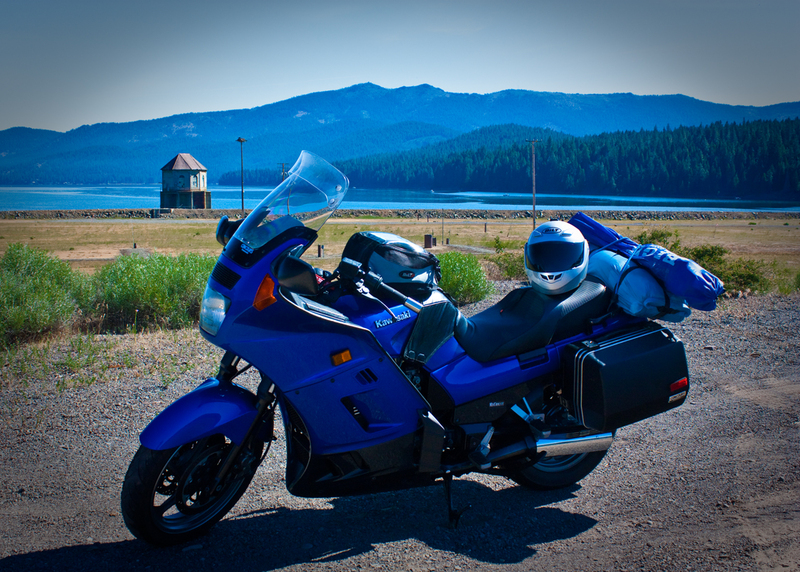 – Roads: Since this trip covered so much territory, I encountered: 20 miles of lane splitting to get around everyone headed for Tahoe, wonderfully engineered and paved roads, nicely paved but less well-engineered roads, and tight curves with limited sight lines on the roads between Shingletown and Dales. – Scenery: What can I say, I have been living in California my whole life and I am still awestruck in seeing its majesty. If you are from some other state, COME HERE AND RIDE! – Weather: The weather was absolutely perfect on this Father’s Day weekend, albeit a little warm at times (high 80s) at the lower elevations. The sky was a sapphire blue with those intense puffy white clouds you want to photograph because they are so perfect. – Challenge: Intermediate throughout with the biggest challenge being not getting run over my a semi-truck on Hwy 5. – Food: Plenty of choices along this route. I stopped at Safeway in Grass Valley and stocked up on healthy food and snacks this time – what a concept! – Gas: There were no problems finding gas, but then again, with my 7.5 gallon tank, I could have done the whole thing on way less than three tanks. – Rating: 5-stars (out of 5) for scenic beauty. 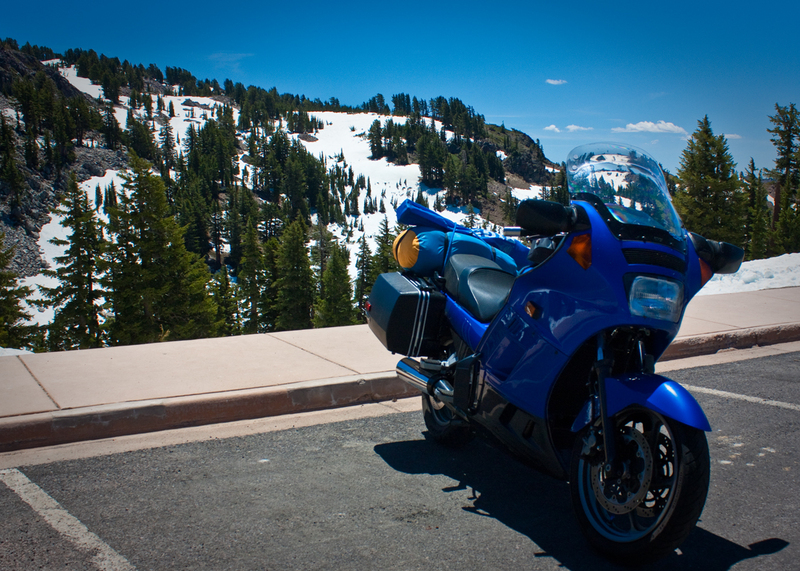 with a few most excellent motorcycle roads thrown in along the way. 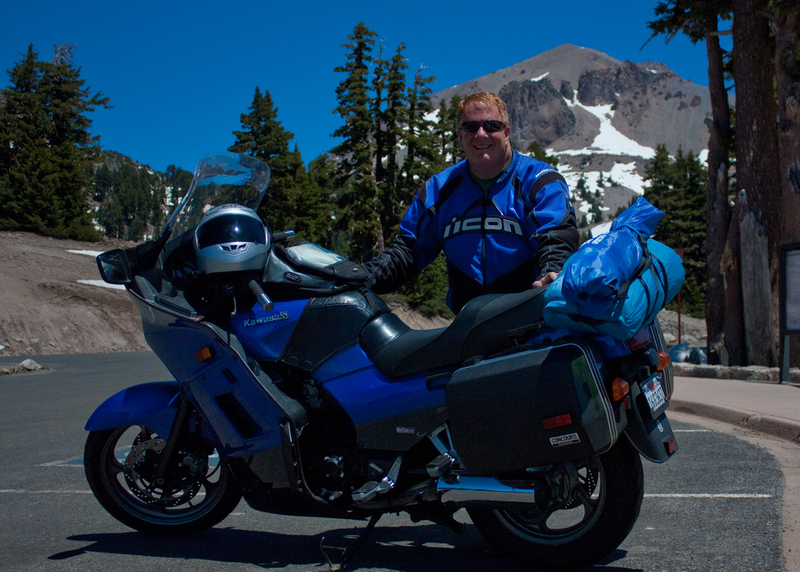 Note: I bought the Destination Highways of Northern California book at the last International Motorcycle Show I attended. It is pretty expensive at $60, but I have to say that it is absolutely worth it. 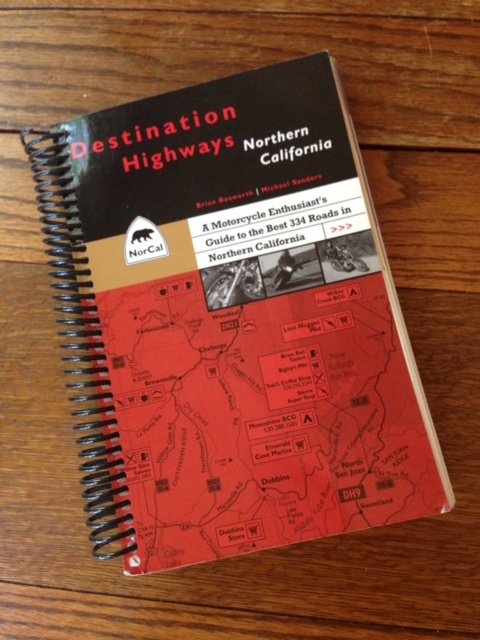 I use it to plan all of my northern california trips to ensure I get the most out of my time on the road. Although it is pricey for a map book, they actually put in the time and effort to bring the value to the rider than exceeds your expectation. 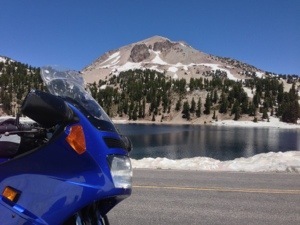 Highly recommended for anyone wanting to ride in northern california. 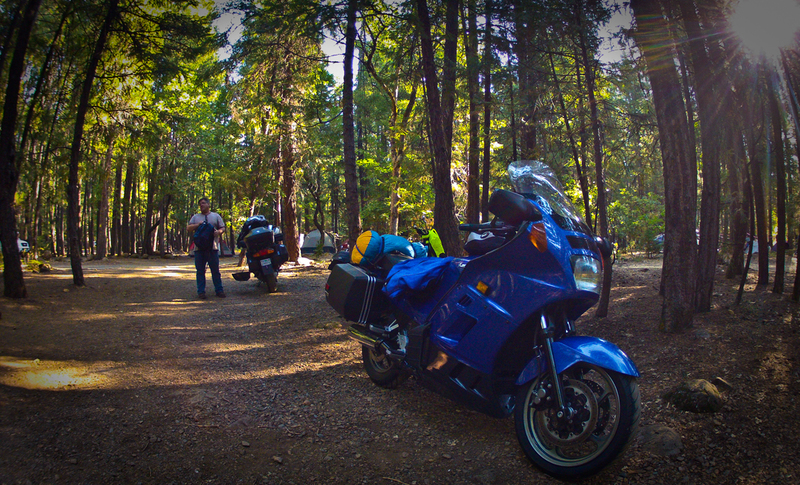 For the third year in a row, my motorcycle buddies and I planned a trip to the High Sierras over the first weekend in October. We have found that this weekend the traffic is nonexistent, the weather is perfect, and the aspens are all turning gold over the mountain passes. This year, our destination was the old west town of Virginia City and we had something special happen. One of our group entered a raffle and won a brand new motorcycle! Bocci wins a new bike! 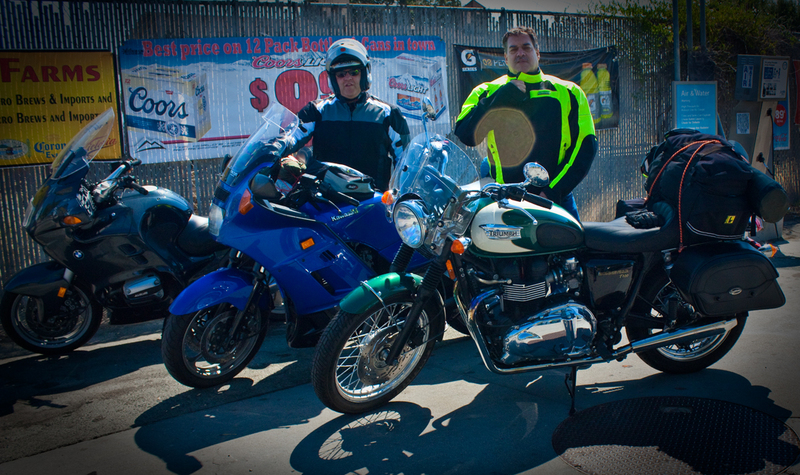 Frequent readers of this blog know that my brother-in-law and frequent riding partner, “Bocci,” rides a Triumph T100 Bonneville that he bought in 2010 as his get-back-into-motorcycling ride. 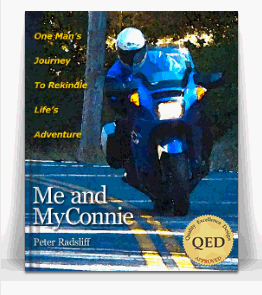 He and I have been all over California and Oregon on my 1,000cc Connie and his 865cc Bonnie. But a while ago, Bocci started to have a wandering eye, making true the sentiment that motorcycling has never really been about monogamy. 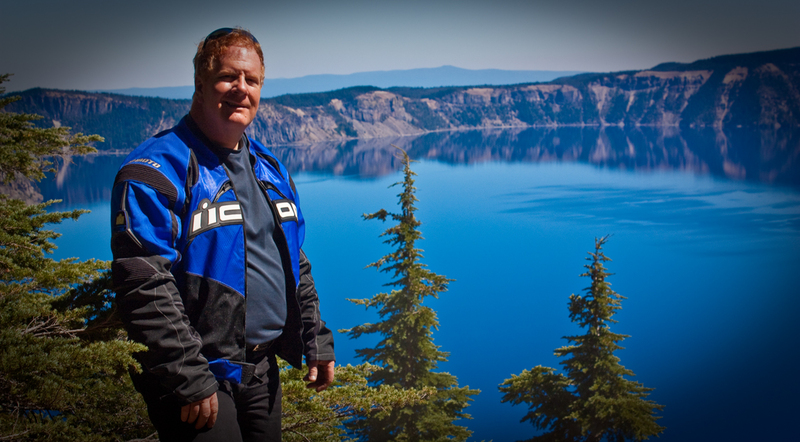 Bocci was first thinking that a pair of KLR650s would be a nice addition to our stable, allowing us to wander farther afield down forest roads. 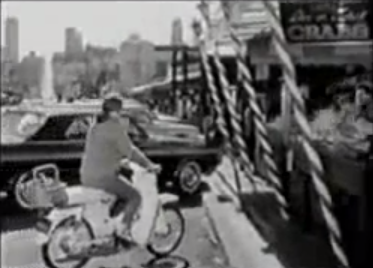 But I knew that in his heart of hearts, he really has always wanted a Moto Guzzi. Being a mechanical engineer by trade, Bocci was not afraid of exotic Italian iron and he has talked himself into how the Guzzi’s transverse vee-twin design would make engine maintenance a breeze. So we put the KLR idea on hold and Bocci started lusting after a dual-sport Moto Guzzi Stelvio NTX. Some months later, and without mentioning anything to me, Bocci noticed that the Pro Italia Moto Guzzi dealership in Los Angeles was holding a charity raffle to publicize the opening of their new Triumph franchise. He bought a dozen raffle tickets for $10 each in hopes of winning a brand new Triumph that was a replica of the one Steve McQueen rode in The Great Escape. 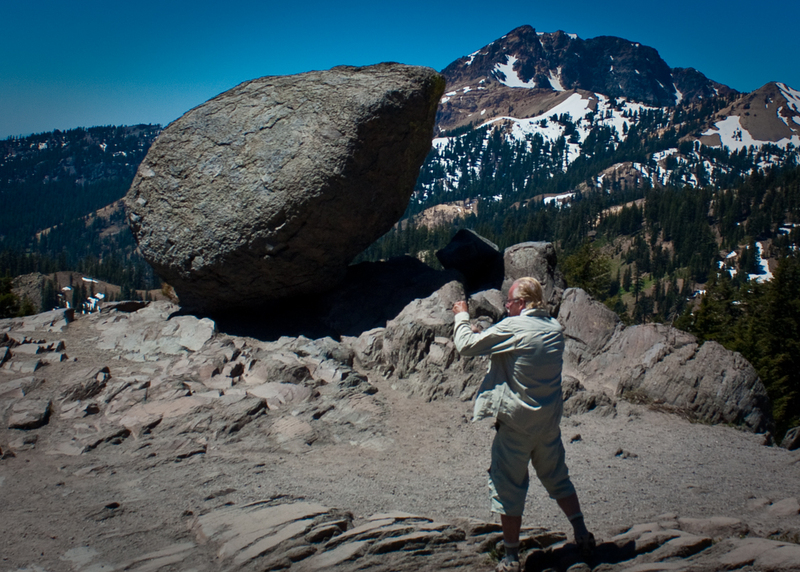 As fate would have it, a week before our High Sierra trip, Bocci was washing his Bonnie and missed a phone call. When he noticed the missed call on his mobile phone, he saw that the area code was from Los Angeles. He told me that his hands started to shake a bit before he returned the call, and sure enough, he found out that he had won the replica Triumph, worth $10,000! The only problem was that it was almost identical to the Triumph he already owned except that it was painted olive drab. Knowing that Pro Italia was also a Guzzi dealership, he asked if he could trade in the Triumph and put the full value towards the Stelvio. Pro Italia was more than accommodating and set him up with the Guzzi of his dreams for a few thousand more. 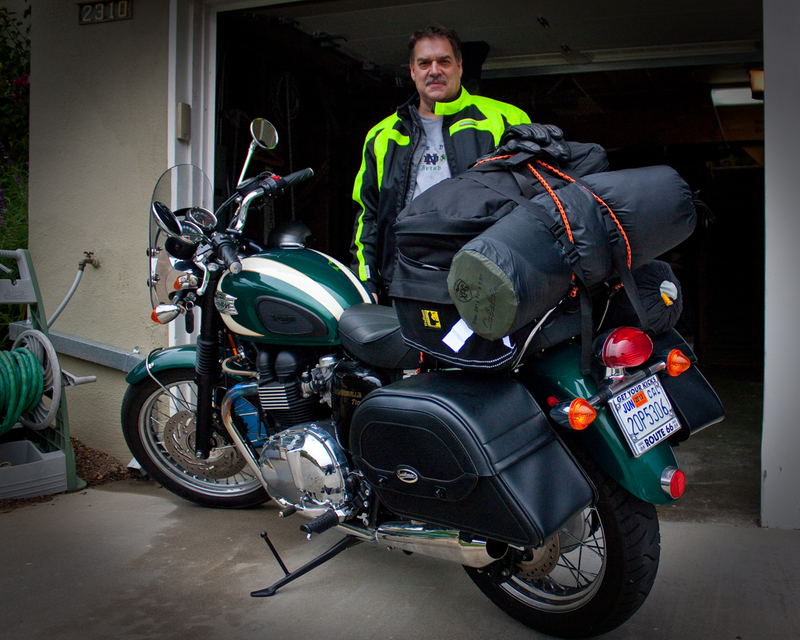 This hit Bocci like a ton of bricks because now instead of prepping the Bonnie for our annual 600 mile High Sierra tour, he was going to fly to L.A., get a motel room, arrange to be picked up by the dealership, pose for press photos with the replica Triumph, then do the paperwork to buy the Moto Guzzi. 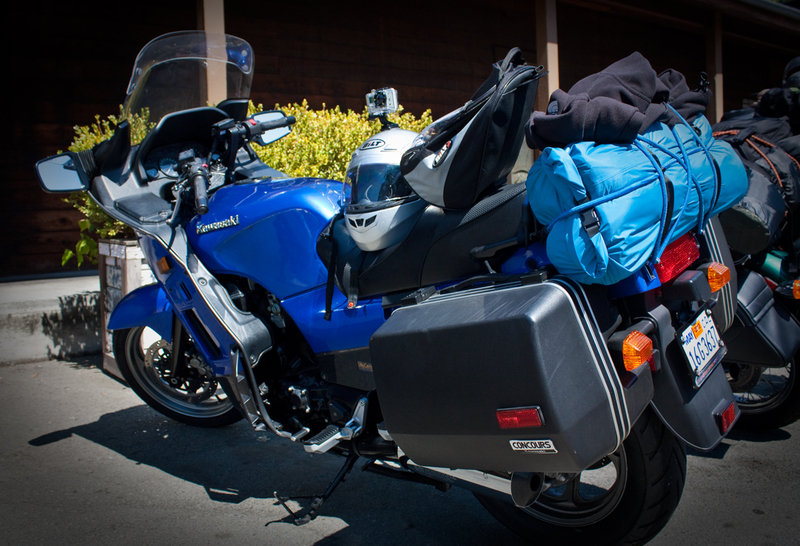 He was then going to pack up the Stelvio with his gear for the trip, swing his leg over a new and foreign bike, and head into SoCal traffic towards the back side of the Sierras where we arranged to meet him in Walker, CA the next day. What an adventure! As for me, I hooked up with my moto-partner in crime, “Ace,” and we headed out to meet Bocci at a Walker barbecue place that we found online. 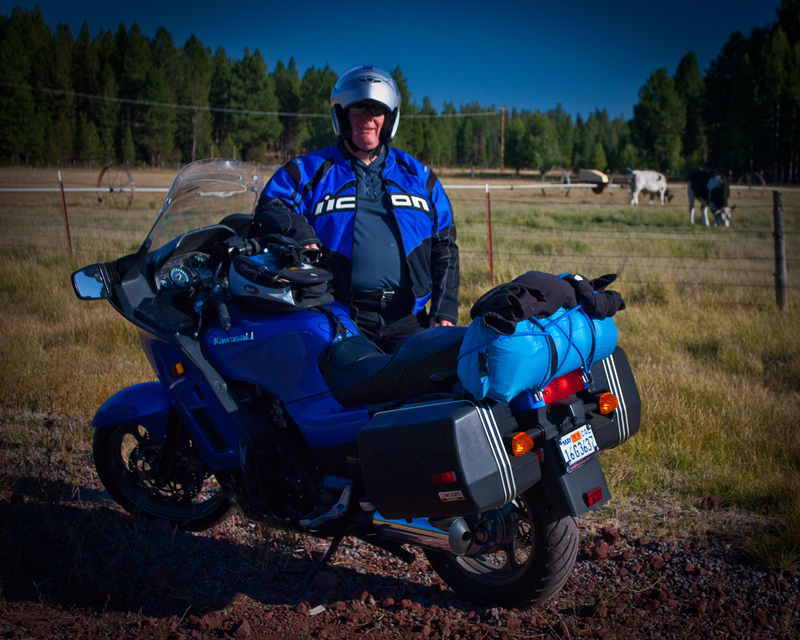 Our fourth rider, Des, was coming south from Jackson and would meet us in Walker, as well. 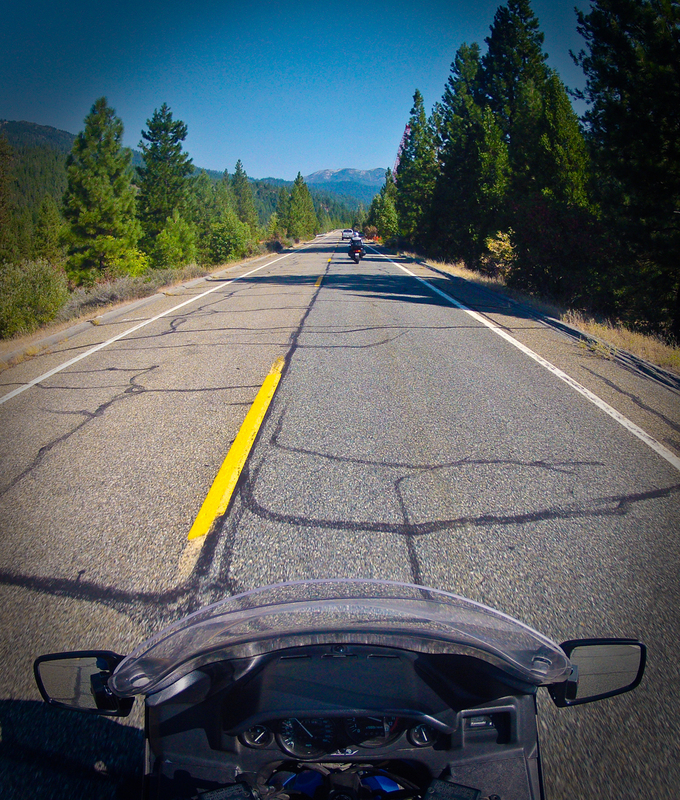 As we expected for an October trip over the Sonora Pass, Ace and I had great pavement, no traffic, perfect weather and gorgeous scenery. But I got a little surprise when I followed Ace as he pulled off at the unmarked Donnell Lake scenic overlook to stretch. 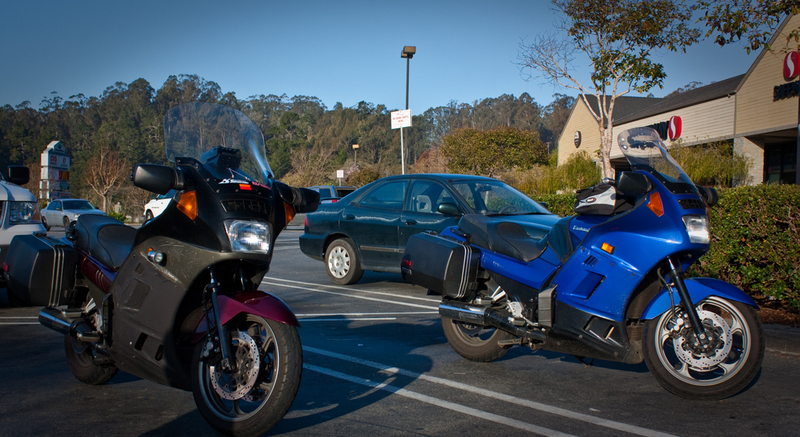 As we dismounted, two other riders joined us in the parking lot, both of whom had BMWs like Ace. 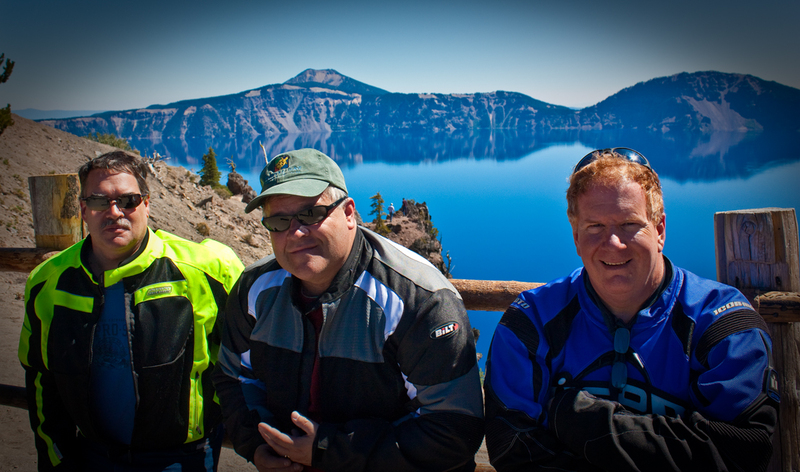 So after a bit of Beemer-banter, we took a few photos at the quite spectacular overlook and started to mount up. Just then, another Kawasaki Concours rider rolled in. 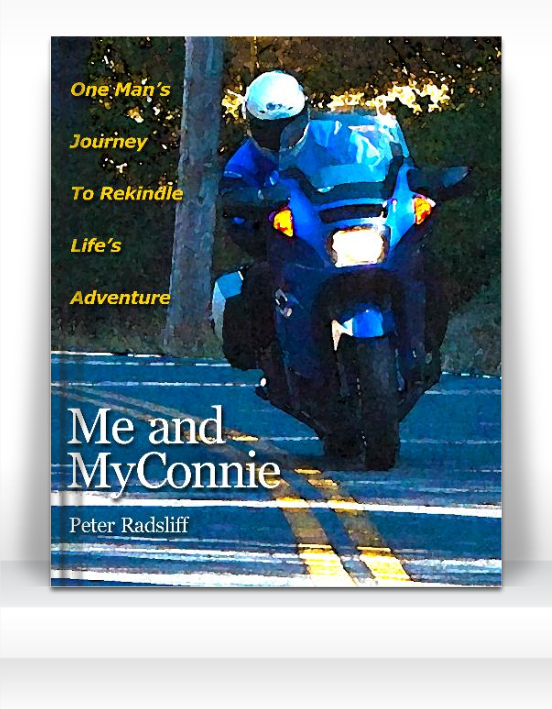 I stopped my gearing up to be neighborly to a fellow Connie owner when he came up to me and said, “Hello, P Radsliff.” Never having met him before, I was somewhat taken aback, and Ace was positively dumbfounded. 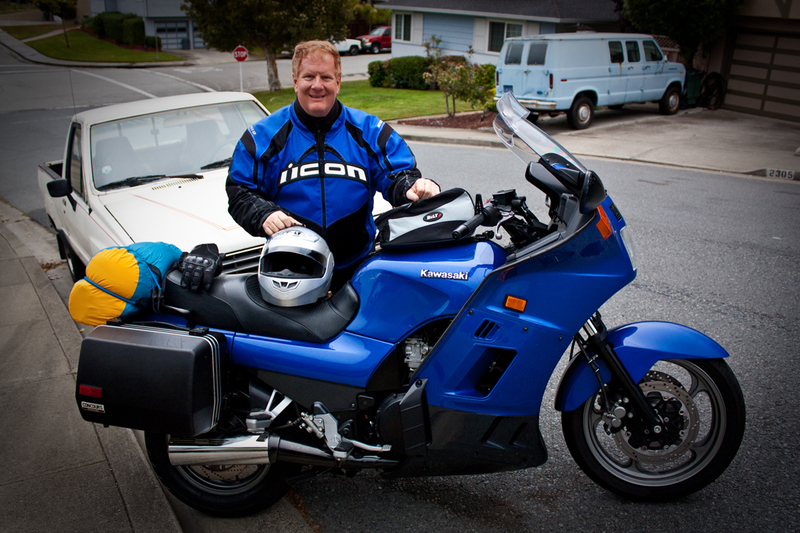 As it turned out, the rider was a member of the Concours Owners Group (COG) and he recognized me from the many photos I posted on the COG forum and from my Me and MyConnie blog. Whereas I don’t think this was my 15 minutes of fame, I still rode out of the parking lot sitting a little bit taller in the saddle, lording my “celebrity” over my riding buddies whenever I got the chance in the following days: see video. It was really great meeting “GF-in-CA” (his COG forum ‘handle’), whose posts I have read and whose opinion I have come to respect. I found out that he is a mechanical engineer and knows what he is doing with motorcycle maintenance. It was great seeing him roll in on his Connie and that it had a bunch of “farkles” on it — i.e. a loose acronym for owner modifications that stands for: Fancy Accessory Really Kool Likely Expensive. He was riding with his wife two-up which was also great to see. 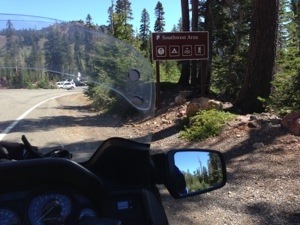 After more pleasantries and a promise to follow up via the COG forum, Ace and I headed east towards Sonora Pass. As the road got steeper and twistier, we knew we were getting close to the pass. But before reaching the 9,624 ft. summit, we rode through a small valley with a dense copse of aspen trees that were all shimmering brilliant gold. We’ve seen this valley in its gold plumage in years past but it was no less breathtaking seeing it once again. It’s the kind of experience where you find yourself yelling “Oh my God, this is incredible” out loud inside your helmet just because you have to share it outside of your inner monologue. In traversing up and over this formidable High Sierra pass, one can’t help but think of the first wagon train that crossed these jagged peaks in 1841. I wonder how different the roads here might have been if these mountains didn’t form a barrier between the gold and silver mines of Nevada to the east, and the international port of San Francisco to the west. 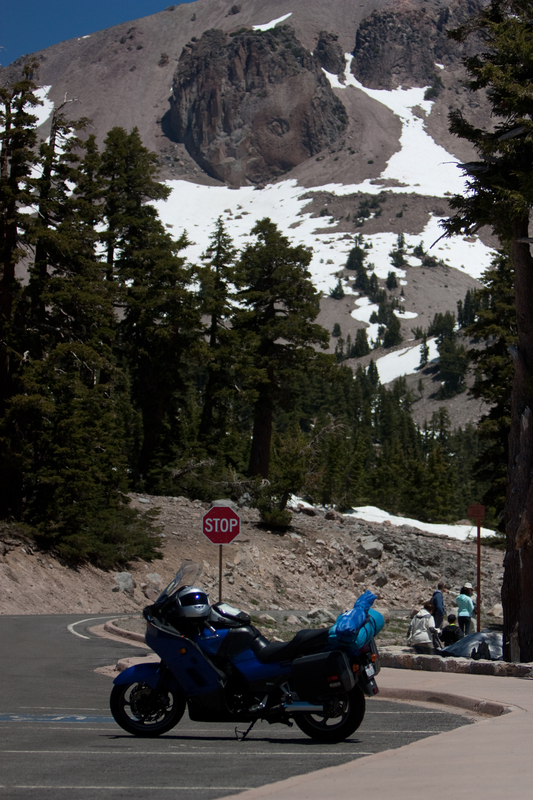 All I know is that the many mountain passes that cross the High Sierras make some of the best motorcycle rides in the world, and they are all in my own back yard. Ace and I continued down the eastern side of the Sierras into climate and country that is very different than the west side of the summit. Out here it’s all high desert scrub, not the verdant evergreen forests we just left behind. 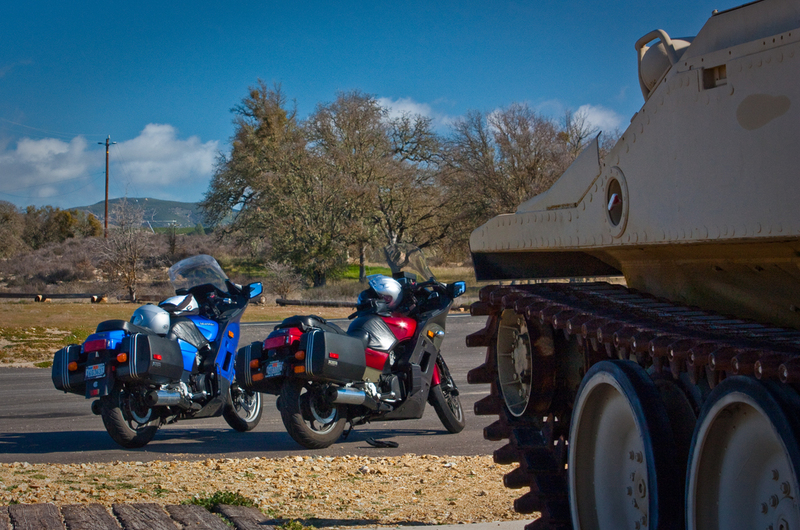 An interesting point of interest we encountered before turning north on Hwy 395 was the Marine Corps Mountain Training Warfare Center which is spread out on the left side of Hwy 108 at Pickel Meadow, CA. It’s not uncommon to see lots of military vehicles running around here, and aircraft as well. Hwy 395 is a U.S. route that starts in Hesperia, CA about 80 miles northeast of Los Angeles, and crosses the Oregon border 557 miles later. It continues through Oregon and Washington all the way to the Canadian border. 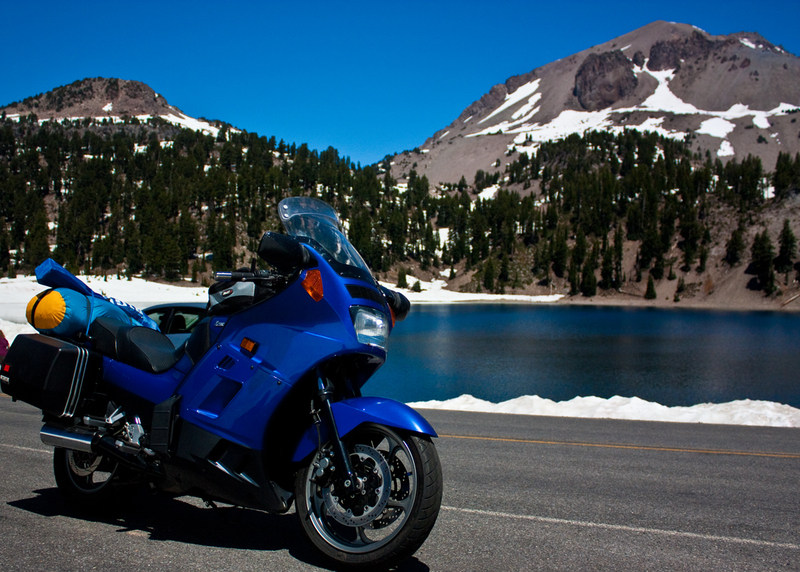 However, in California, state route 395 crosses through terrain that is arguably the most varied and beautiful in the state. Bocci was making the trek from the Los Angeles area up Hwy 395 so he was able to enjoy the stark but beautiful Mojave desert, followed by the spectacular Owens Valley which is just 60 miles west of famed Death Valley. The Owens Valley is framed by mountain escarpments that include Mount Whitney, the highest peak in the contiguous United States at 14,505 ft. The Owens Valley even features glaciers! Bocci stayed the night in Mammoth Lakes before heading north towards Walker and our rendezvous at Mountain View Barbecue. We meandered alongside the Walker River which parallels Hwy 395 through deep canyon gorges and wide open high desert plains, eventually coming into the little town of Walker and our new rally point. We were greeted by a parking lot made from two-inch deep pea gravel which always makes for interesting maneuvers on a motorcycle. We saw two bikes parked at the restaurant, an orange Triumph Speed Triple that we knew belonged to Des, and a behemoth of a bike: the Moto Guzzi Stelvio NTX: see video. Approaching the Stelvio from the rear was kind of amazing. With its aluminum panniers, it measures in at 42″ wide—that’s quite a bustle on its hustle! My first thought was that we wouldn’t be lane splitting anytime soon. 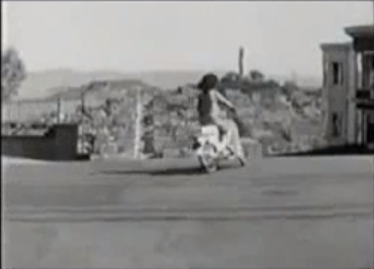 As I walked around the bike, it was truly a thing of beauty—in a rough and tumble kind of way. Like a HumVee, but as if it were designed by Italians. The Guzzi had interesting angular lines with utilitarian bolt-ons, like the panniers and skid plates. As I walked around the bike, Bocci approached and greeted me by saying, “She’s a stout beast.” No doubt, I thought. During our excellent BBQ lunch, Bocci regaled Des, Ace and myself with stories of his adventures: doing the winner’s photo shoot, packing the Stevio, and heading off into L.A. traffic. He told us about the Guzzi’s massive low-end torque and how well it handled for such a big bike. 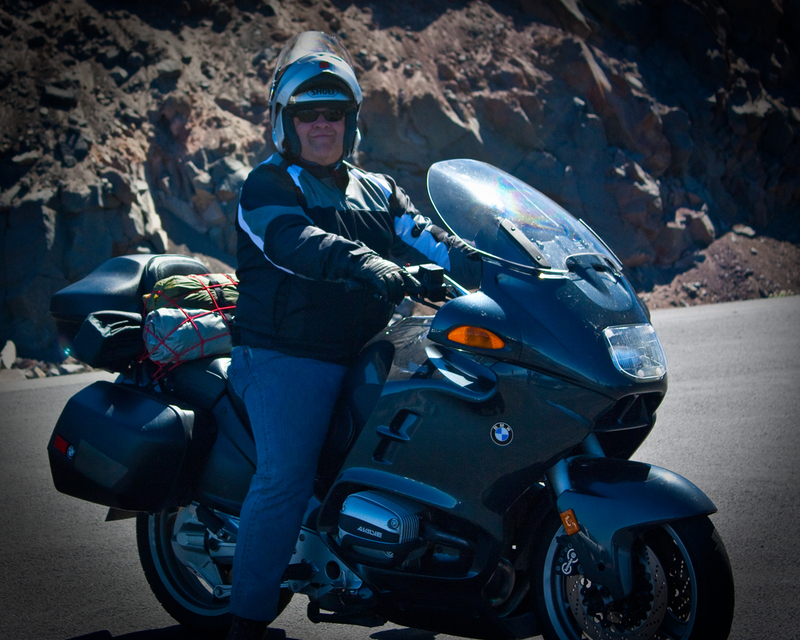 He bragged about its massive 8.5 gallon gas tank that gave him almost 350 miles range. I guess I can’t boast about the “measly” 7.5 gallon tank on MyConnie anymore. 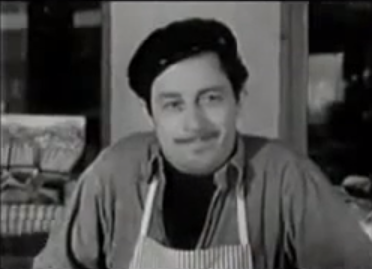 But Bocci had a few problems, too. A snap-in turn signal cover vibrated loose and fell off somewhere along his ride. And he felt a strange vibration that he couldn’t tell whether it was intermittent, and/or even normal for this bike that was new to him. 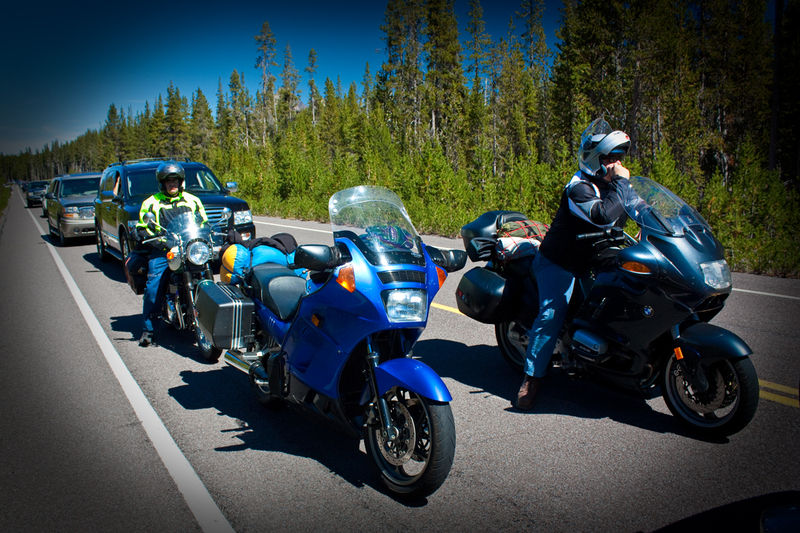 He also experienced first hand a characteristic that is prevalent with transverse vee-twins: rev the engine while stopped at a light and the bike lurches sideways from the torque. Still, nothing could wipe off the ear-to-ear grin from a guy who had just won the bike of his dreams. Damn! Attaboy, Bocci. 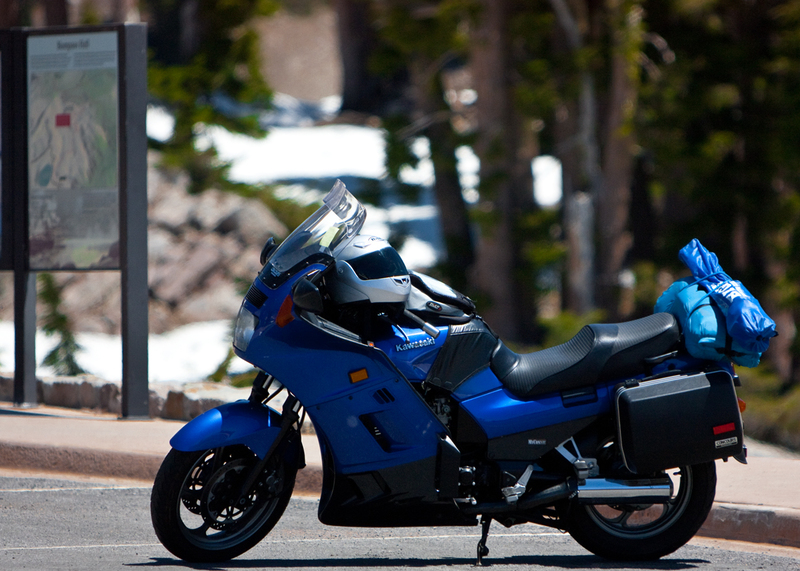 “Join for the bike, stay for the people” is the motto of the Concours Owners Group (COG). 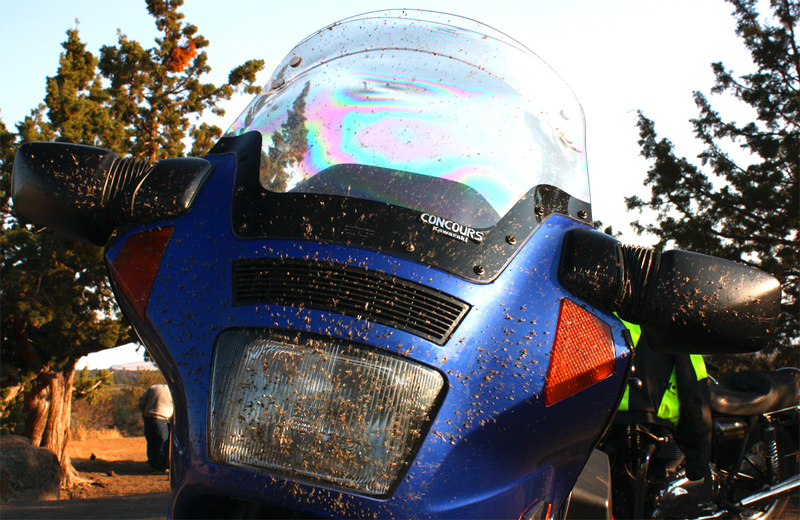 I echoed that sentiment myself the other day when I saw a post from a member who’s nom de plume is “SantaCruzRider.” He asked in a post on the COG Forum whether any member from the Bay Area wanted to go on a ride. Since I could tell where he lived from his moniker and knew what kind of bike he rode, I thought there could be immediate synergies. I’ve been a member of COG for about a year and a half and have found their members to be a great group of people interested in helping each other out while in pursuit of our common passion. 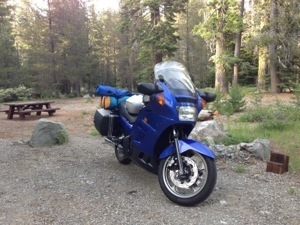 So I posted a reply that I’d love to do a ride to Big Sur on California’s central coast and that I had read about a great motorcycle route through the Fort Hunter Liggett military reservation to Highway 101 on Pashnit.com. I was treated to an almost immediate reply, so we chose a date via email and scheduled our trip a few weeks ahead. 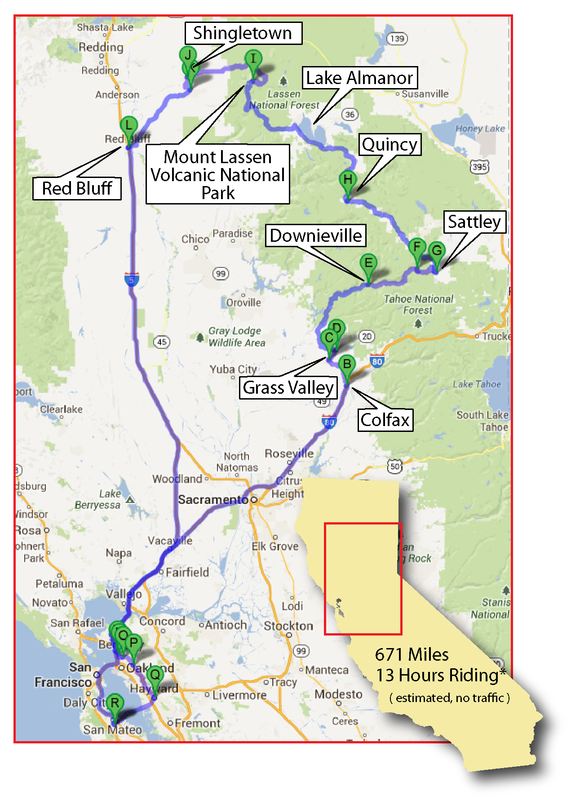 After doing some online research and route planning, I proposed a specific route to SantaCruzRider that packed too much saddle time into one day. 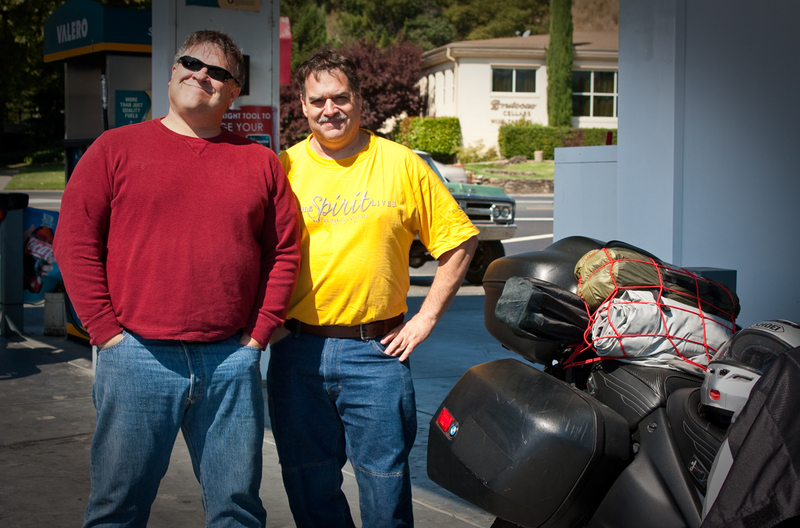 He suggested we start off in Prunedale and take Hwy 101 down to King City and then head west towards Big Sur. His rationale was that it would be much more fun to ride with the sun at our back than glaring into our eyes while riding steep and twisty mountain roads. Boy, was he right! 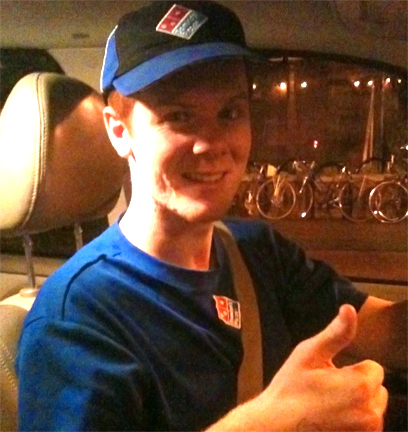 I learned a good lesson that day, which was to plan for the light when you have the option to choose directions. This made for better photography with the bikes as well. So I left my house in San Mateo at 6:30 A.M. and headed south down Interstate 280, then Hwy 101 towards Prunedale, about an hour and fifteen minutes away. Although the forecast showed a 0% chance of precipitation, when I left the house the streets were all wet from a cloud system that apparently didn’t pay attention to weather.com. Though I hit some wet roads and light sprinkles in San José, it was otherwise dry and clear. The temperature was brisk at that time of morning, in the low 40s. 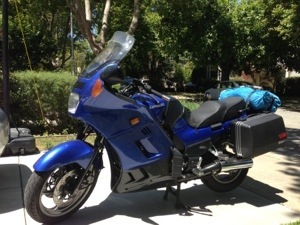 But MyConnie’s full fairing kept me warm and dry as I flew down the highway. 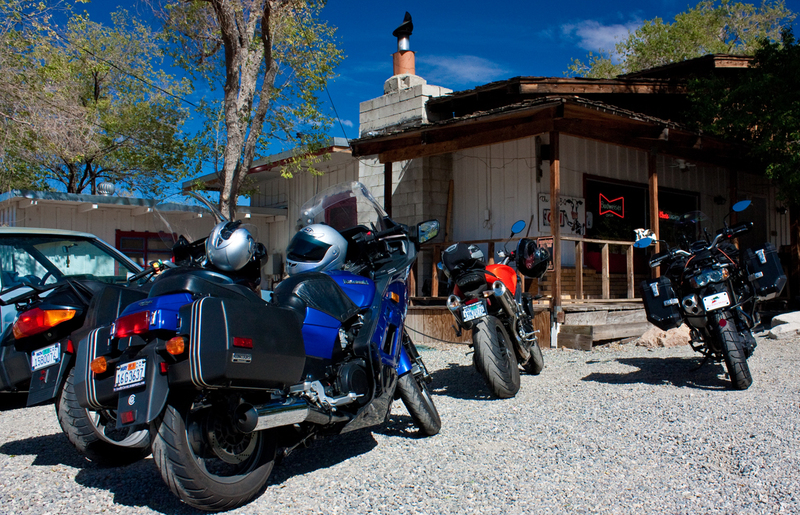 As I got to Prunedale, I spied a gas station still a few miles before the rendezvous point. 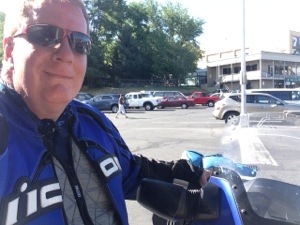 I decided to top off my gas here and leisurely check my tire pressure and pursue any other morning ablutions prior to meeting my new riding buddy for the first time at Starbucks. As I pulled into the station, I see another Connie getting air and knew immediately that it was SantaCruzRider, and he knew it was me. After exchanging pleasantries and tending to our bikes, I reflected on what an interesting and tight-knit community we Connie riders are. 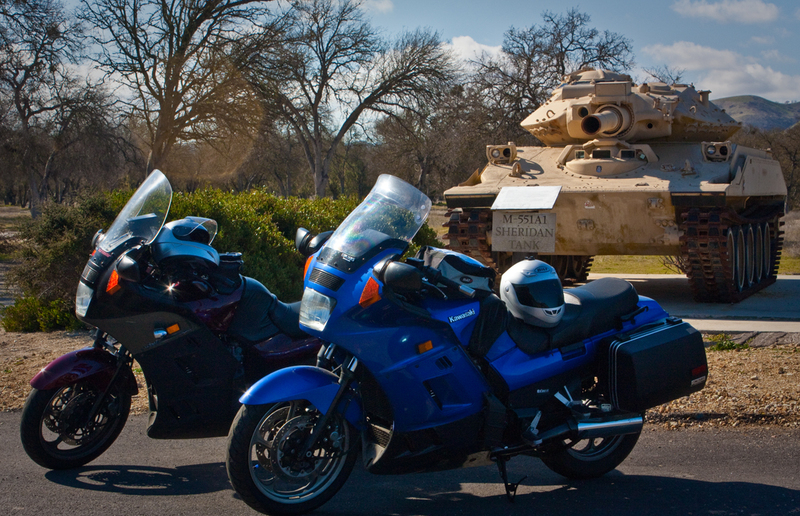 We are tied together by our choice of two-wheeled platform, and by the commonalities that caused us to gravitate towards the Kawasaki Concours in the first place. If I were to prognosticate, I’d suggest that Connie riders are pragmatic, frugal, social, independent, wise and fun. I base this on reading hundreds of blog posts from COG members and forming a stereotype of a prototypical Concours rider in my mind’s eye. How else would you describe people who gravitate towards a bike that isn’t great at any one thing, but is really good at a doing them all? And these are people who have eschewed spending big bucks on a Beemer, choosing instead to invest two or three grand on a bike that will run for 100,000, or much more, that they can work on themselves, and that provides little glitz but plenty of “get up and go.” That is, until all practicality goes out the window and a brand new $16,000 C14 Concours goes in the garage. Hey, what can I say? COGers are an enigma. 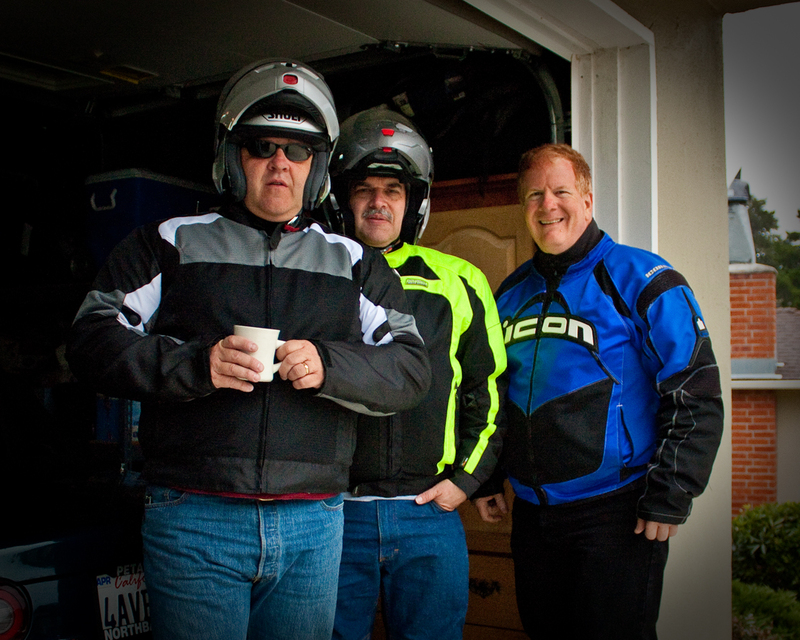 We hopped back on the freeway and headed to our original rally point at the Prunedale Starbucks next to Safeway on Vierra Canyon Road, each choosing to kill the morning chill with a Venti cuppa Joe. We took some time to chat about our jobs and families, and Connie’s of course. 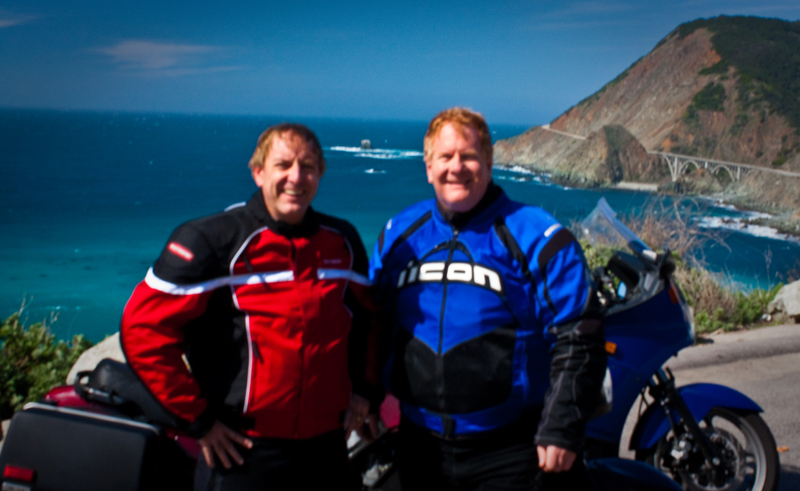 We each found out why we got back into motorcycling after a long hiatus and why we both stumbled upon the Concours and discovered it was the perfect bike for commuting during the week and touring on the weekends. But soon enough, the road beckoned to both of us. 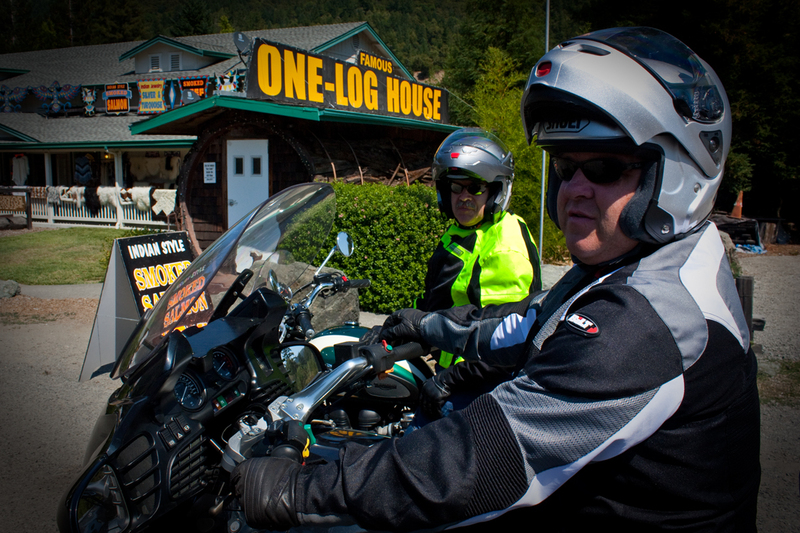 So we saddled up, and headed the 45 minutes south to King City. 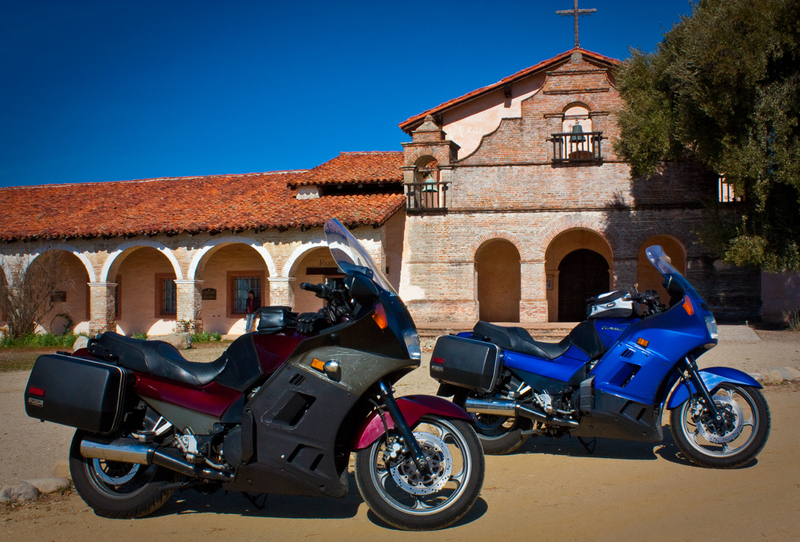 We took Jolon Road west for 20 or so miles and then turned right on Mission Road towards Fort Hunter Liggett. The turn-off was hard to miss considering the welcome mat was a 15 ton Sheridan Tank with its 152mm gun leveled right at us! Fort Hunter Liggett is a 168,000 acre military reservation that boasts “a mission to provide world class training for Combat Support (CS) and Combat Service Support (CSS) units and to become the best training center in the Western United States for the U.S. Army Reserve.” I’ve been past this area both on Hwy 1 at the coast and on Hwy 101 many times and never knew it was there. 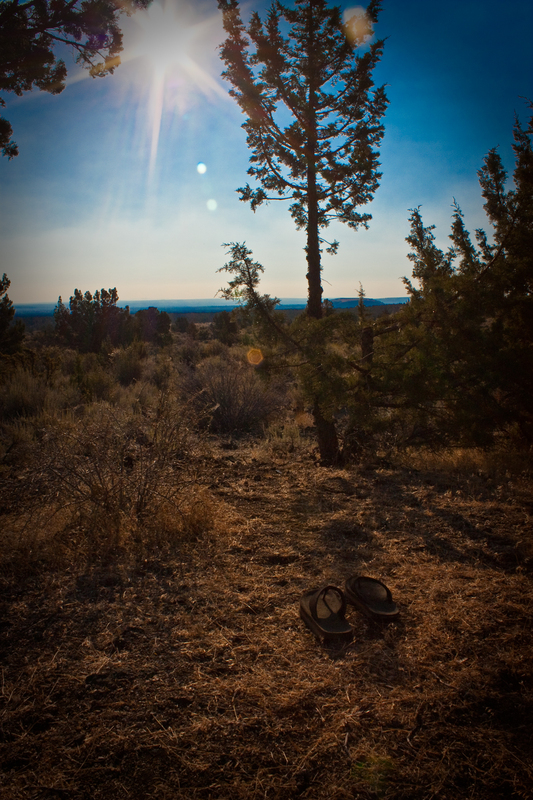 Remoteness is probably one of the best reasons for its location. That, and it sports a 360 degree live fire range. Hoo-yah! 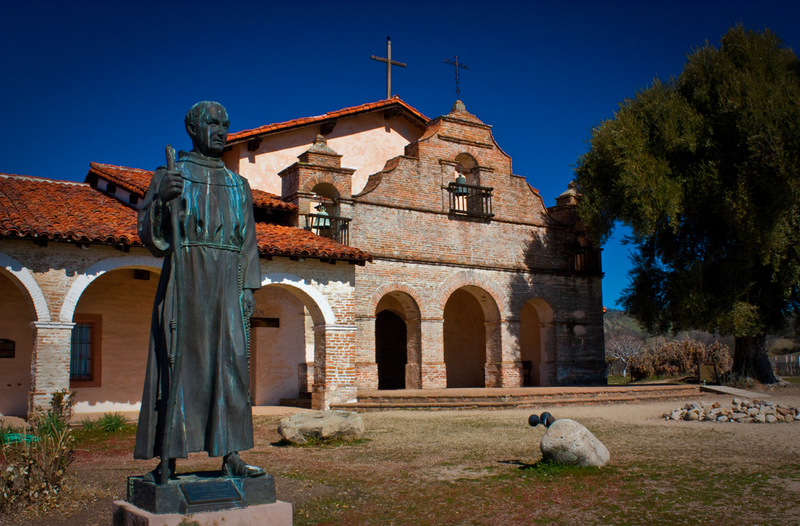 But paradoxically tucked right next to all that state-of-the-art weaponry is Mission San Antonio de Padua, the third of what would eventually be 21 missions that stretch from San Diego to Sonoma, California. 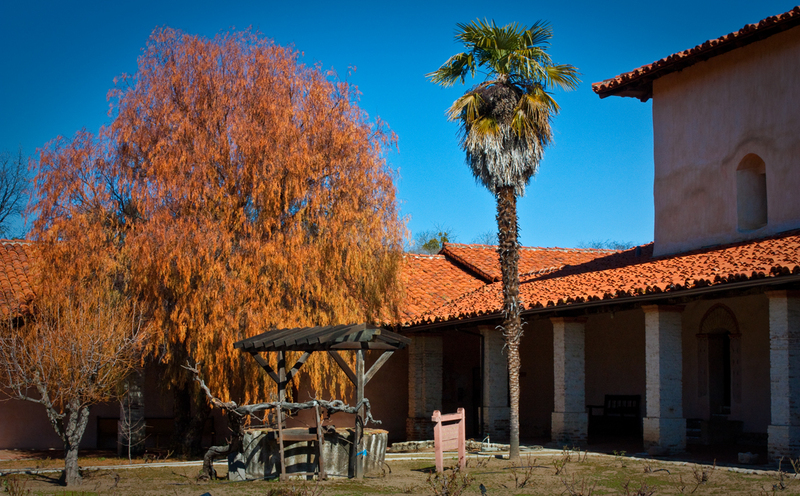 Founded in 1771 by Father (now Saint) Junipero Serra, Mission San Antonio de Padua is the largest of the 21 missions and is still an active parish, with 35 families attending services there. 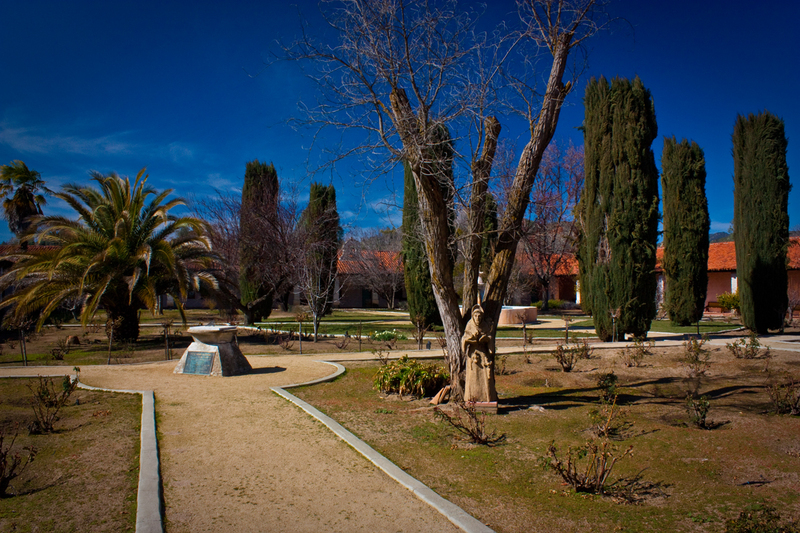 The grounds are quite impressive and this would be a great place to spend more time to delve into local history. But on this trip, we only had time for a few photos, a quick look around and a rapid-fire historical overview and fund-raising pitch from the docent. 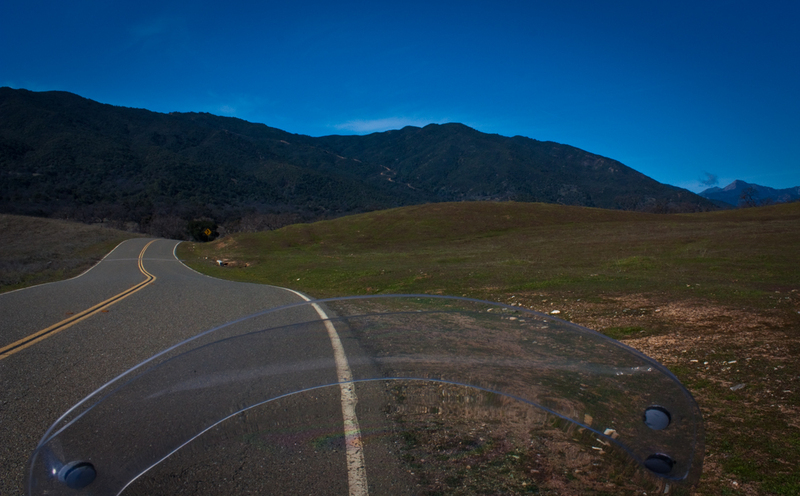 Leaving the mission, we turned onto Nacimiento-Fergusson Road towards the mountains of the Los Padres National Forest. I can see why the Spanish settlers called the land surrounding the Mission “the Valley of the Oaks.” Unlike parts of northern california, the land heading up to the coastal range mountains was chock full of oak trees, not the one or two found on most hills in Marin. Whether because of climate or isolation, you get the feeling like you’re stepping back in time seeing these wooded hills as they were meant to be. The gentle rolling hills gave way to curves that follow a stream through the mountains. Then you start a climb up and over an impressive range of guardian mountains to the coast. A note to photographers: there are only a few pullouts where stopping to take a photo is possible, so when you see one, pull over. You won’t find another one farther on that is better. And with the curves getting ever tighter and steeper, turning around is problematic. The trip over the mountains was easy, or would have been if not for rock debris in just about every tight corner. 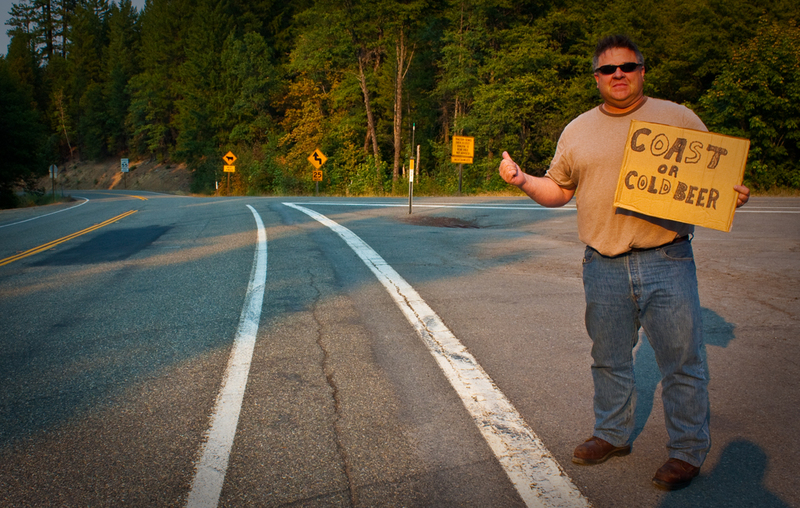 The narrow road without center-stripe was typical for these types of roads, making speed control highly important. Luckily, we only passed a few cars coming the other way. But the blind curves and lack of guard rails made it impossible to do anything but leisurely meander around all the turns. 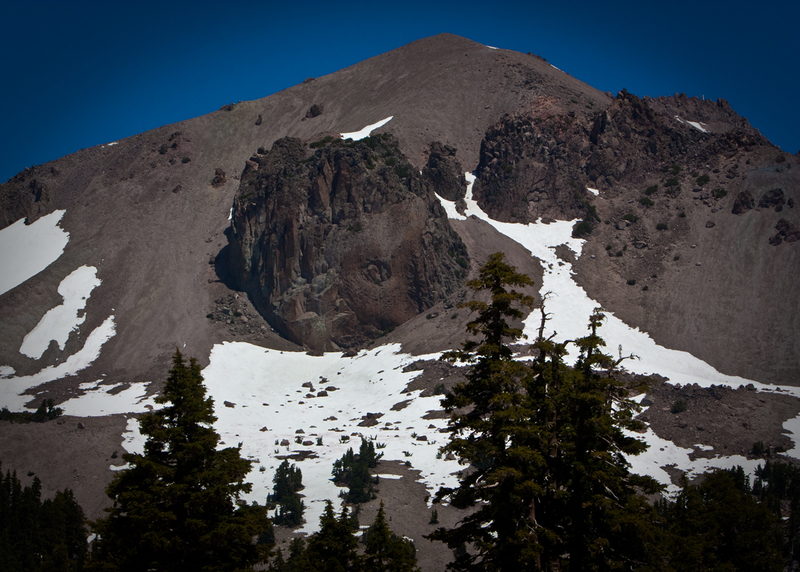 Once we broke out of the trees and crested the summit, we started down a steep set of switchbacks. 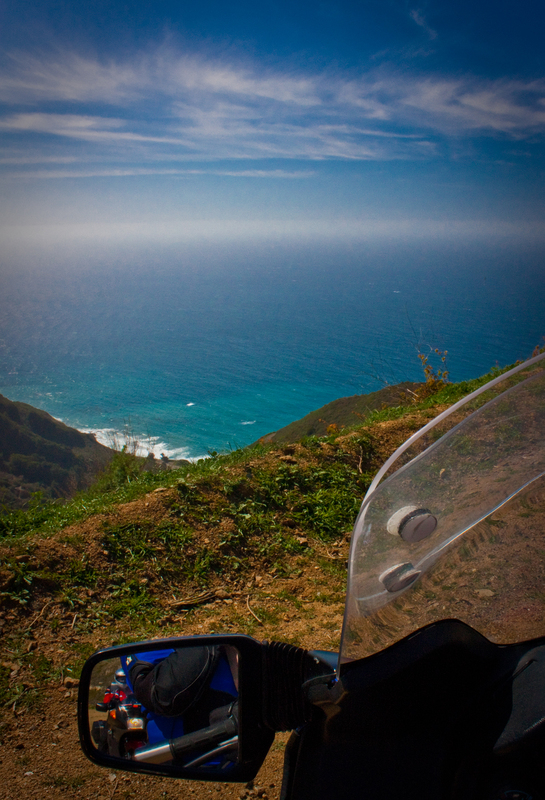 Soon enough we were treated to a breathtaking view of the Pacific. 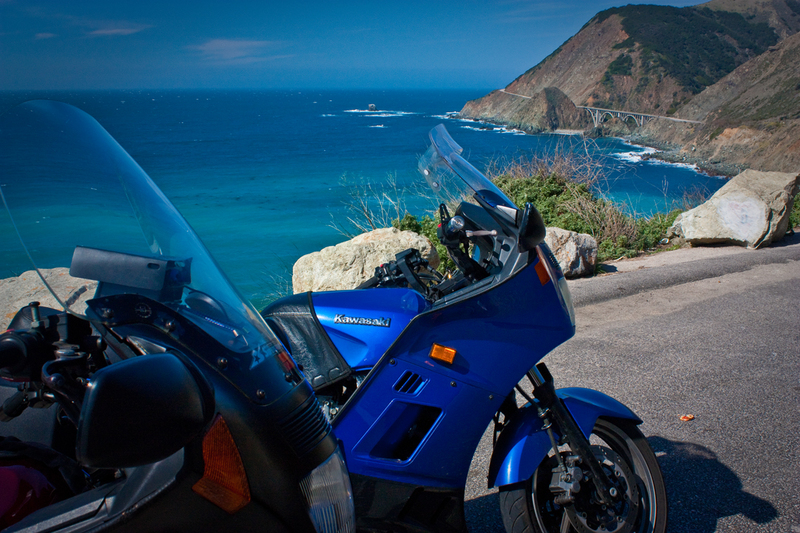 On this day, the water along the Big Sur coast was a deep azure blue, not the grey-green I had become used to from years of scuba diving the waters around Monterey Bay. It seemed that we had lucked into those most rare of occasions on California’s central coast: a brilliantly sunny day with particularly good ocean visibility. It produced a quality of color in the ocean that I haven’t seen in years. And just to complete our spectacular vista, the sapphire water contrasted with white-crested waves, seen from thousands of feet above the beach atop our mountain road. Simply, brilliant. Anyone who has seen car commercials filmed in California has seen the Marin Headlands, Fort Point under the Golden Gate Bridge, and the famous Bixby Bridge on Highway 1 at Big Sur. There are a number of bridges that follow the same architecture as the Bixby Bridge which was undergoing renovation at the time of our trip. The one in the distance below is not Bixby, but one bridge further south, but it is no less spectacular with its 1930s design ethic. I’ve always wanted to photograph the Bixby at sunset from down on a nearby beach. Today was not that day, but someday soon it will be. We decided to have lunch at the iconic Nepenthe Restaurant in Big Sur that looks out over the crashing waves of the Pacific. 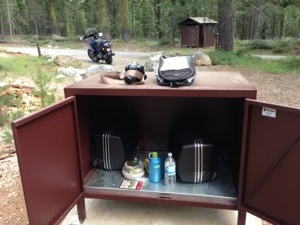 Being able to park our bikes where cars could not helped us in getting right in to eat. But if you are driving a car, parking can be a problem on busy days. 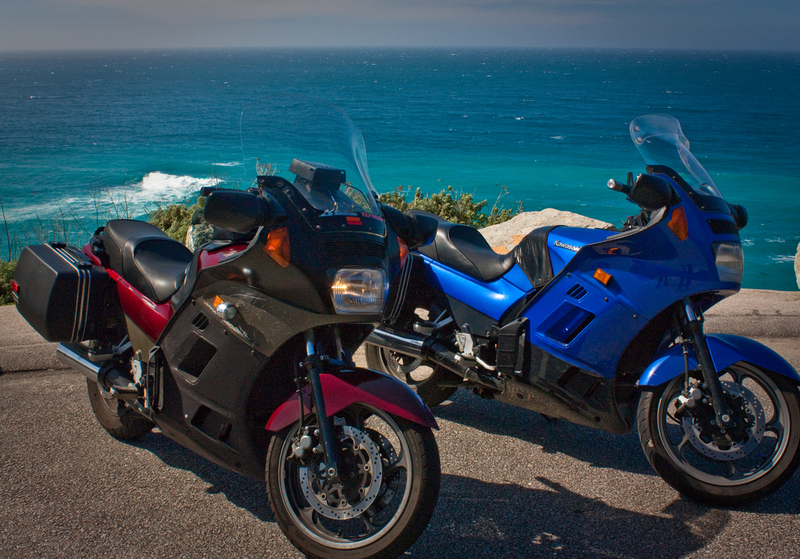 For two hungry bikers, seats at the bar trumped an ocean view. So we sidled up to the bar, ordered, and ate our fill. But all of the crazy wind-tossed riding and debris-strewn mountain curves flew out of my mind when I got home and saw my photos on the computer for the first time. Indeed it was a great day: beautiful weather, gorgeous scenery and a newfound friend. It was all perfect except for trusting my final shot to a passing vista point tourist. Here’s to the gray-bearded gentleman in the white sedan: next time, press the button down half-way to focus—like I mentioned—before taking the photo by pressing it down the rest of the way. Oh…nevermind. – Roads: All well-paved with inclusions of a few rocks here and there in turns that have no guard rails next to thousand foot cliffs – just to keep things interesting. Afternoon quartering winds on the coast with heavy unpredictable gusts made cornering on Hwy 1…uhhhh…thrilling. – Scenery: This time of year we were treated to rolling green hills thoroughly dotted with oak trees which gave way to heavily forested and impressively high mountains with breathtaking views of valleys on one side and the pacific on the other. – Weather: The weather was perfect on this late February weekend, sunny in the 50s with puffy clouds after the morning fog burned off. Summertime temperatures in the Ft. Hunter Liggett area can get very warm followed by the cool breezes of the coast, so be sure to wear layers. – Challenge: Intermediate but very approachable for beginners. 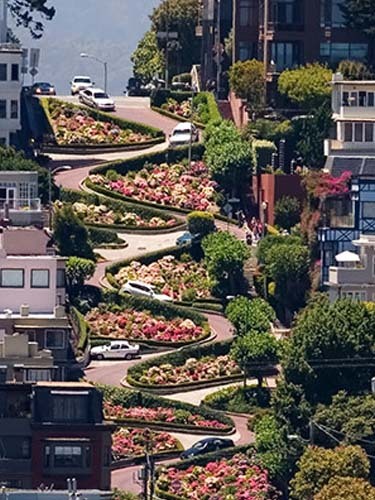 However with no guard rails on tight curves next to sheer cliffs, you’ll need to be very careful. This is not a churn and burn road for canyon racers…not in the least. 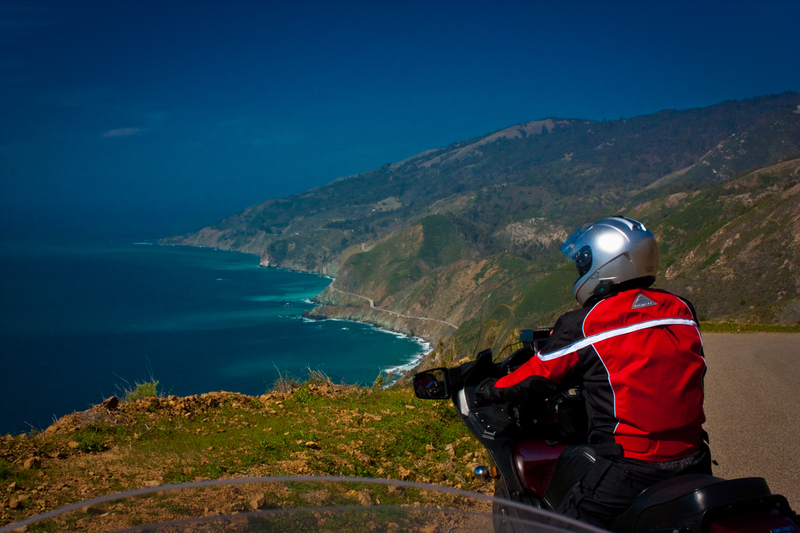 Too much corner debris in the mountains and too many tourists on the Big Sur coast. – Food: We didn’t see any gas or food between Hwy 101 and Hwy 1 so bring your own food as necessary. 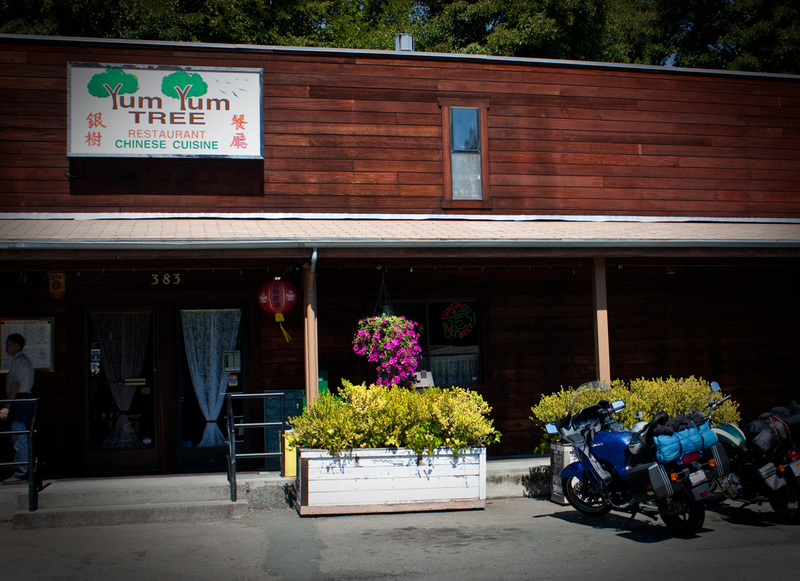 Lots of great places to eat in Big Sur, though. – Gas: We also didn’t see any gas stations between Hwy 101 all the way until Carmel, about 100 miles, so plan accordingly. – Rating: 5-stars (out of 5) for scenic beauty alone. I will be doing this ride many times again in the future. 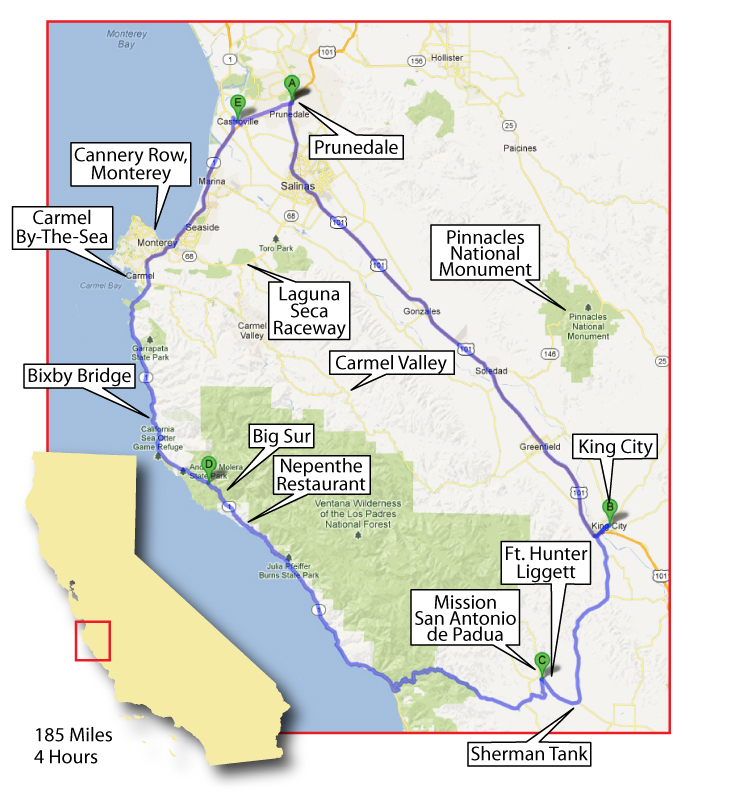 – Additional Fun: Although this time we didn’t include a ride through Carmel Valley, a trek to Pinnacles National Monument, a visit to Cannery Row, or a pilgrimage to the Mazda Laguna Seca Raceway, there are an inordinate number of fun things to do and see in-and-around Monterey Bay. 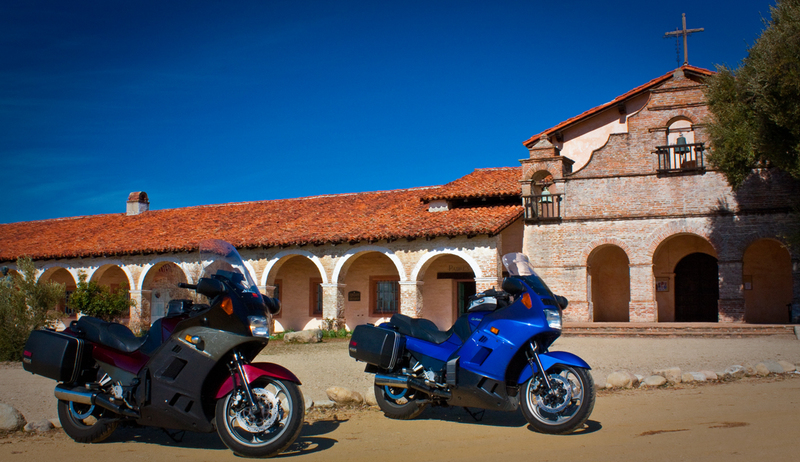 And Hearst Castle at San Simeon is only another 35 miles south on Hwy 1! This would be a great three-day trip for anyone coming from out-of-state. As for SantaCruzRider and I, all this and more is a mere twist of the wrist away.